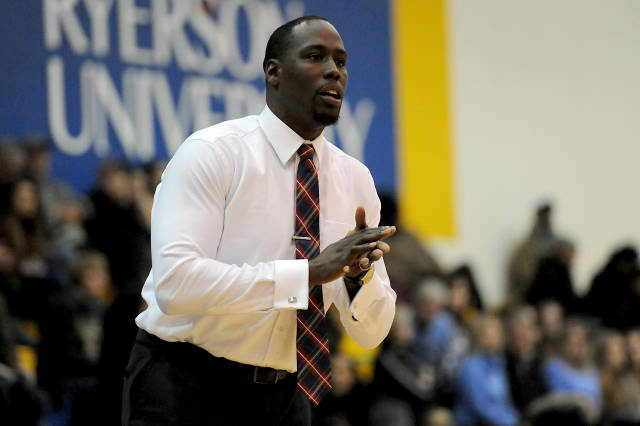 Ryerson men’s basketball coach Patrick Tatham has been named the Canadian Interuniversity Sport (CIS) coach of the year. This comes just a few days after he was named the Ontario University Athletics (OUA) coach of the year after leading the Rams to their first OUA title. After spending five years as an assistant coach under Roy Rana, Tatham is making the most of his season as interim head coach. The Rams continue to make history under Tatham, as the team climbed its way up in the Canadian university rankings to No. 1 earlier this season, and stayed there for four weeks, another first for Ryerson. This is not Tatham’s first stint as the interim head coach with the Rams. In the summer of 2013, Tatham assumed head coaching duties of the team during its international trip to China. Prior to coaching the Rams, Tatham coached at Stoneridge Preparatory School in Simi Valley, California for one season. He was also the manager for the Canadian junior men’s national team in the summer of 2012. The men’s basketball team enters the CIS championships in Vancouver as top seed – also for the first time. The Rams will face the University of British Columbia on March 17 at 8 p.m. in the CIS quarter-final.